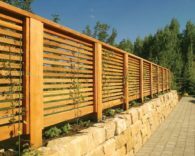 Do Good Fences Make Good Neighbors? - Jon S. Henricksen, P.C.Jon S. Henricksen, P.C. We’d all like to think so. The saying comes from Robert Frost’s “Mending Wall” which was published in 1914. But even before that, in the mid-1700s, Benjamin Franklin wrote in Poor Richard’s Almanack, “Love your neighbor; yet don’t pull down your hedge.” With those seemingly wise words, you wouldn’t think there’d be any problems, would you? Guess again and don’t forget the Hatfields and McCoys. Living near your neighbors can be a boon to your life. You can make great friends, have people close that you can count on, share experiences with and even feel safer in your community. But, as with most things, there can be a flip side. You may find yourself in dispute with them over the maintenance of fences and boundaries, new construction that may obstruct a view or that you think is encroaching on your own property, or noise coming from their side, that’s driving you crazy. Don’t forget that you are legally entitled to quiet enjoyment in your home. A note: if noise is the issue between you and your neighbor, keep a diary of the dates of the noise and what kind of noise it is. You may want to record it from your own home if you are able to. This will be helpful to you later on if you use mediation or some other means to resolve your issues. There is also a possibility that your neighbors have no idea how loud they are. This might just wake them up. In any of these circumstances your first thought will probably be to just go over there and have a chat. This may resolve the problem right away, or you may find yourself facing resistance. What may seem to you to be a reasonable request may not hit your neighbor in the same friendly way. This may be a good time for you to seek legal assistance. In all likelihood you and your neighbor will remain so for years to come, and before this dispute grows into something larger and uglier, it’s best to deal with it early and in a way that is fair to both of you. You don’t want to spend decades with this festering and making you miserable. Consulting an attorney doesn’t mean that you’ll necessarily wind up in court. Depending upon the circumstances we can help you with negotiation and settlement. In one instance, uncertain boundary lines may be worked out through an administrative remedy in Oregon called property line adjustment. This can be a complicated procedure, and we will work with you on it. You don’t want to miss any of the fine points and not achieve the goal you’re looking for. Uncertain boundary lines can have a future financial impact should either neighbor want to sell or build. In the case of a sale, a buyer may just back out of the transaction if the size of the lot is not as represented. Getting back to those fences… if you’re going to put one up that sits on their land as well as your own, put in writing who is responsible for what. Maintenance and repairs should be assigned to one side or the other, or both. If it’s not in writing and you wind up in court, past behavior is what the courts will look at in determining an outcome to a fence or border dispute. It will be great if you can work out your differences amicably. But if you can’t, please give us a call at 503.655.7555. We offer many years of experience in real estate law as well as a wide range of other legal specialties. There’s no reason you shouldn’t be happy in your own home.